I thought of Buckley’s quip when Ontario Finance Minister Vic Fedeli recently released a report on provincial finances, which showed Ontario’s books are in worse condition than the previous government suggested and the province will spend $15 billion more than it takes in this year. Given the scale of the deficit, members of the new Progressive Conservative government can be forgiven if, after looking at the numbers, they had a “Buckley” moment and considered the virtues of a recount. Clearly, the new government has its work cut out for it. How should it try to balance the books? One option it should immediately rule out is higher taxes. The province already has a complicated, anti-growth and overly burdensome personal income tax system. This discourages productive behaviour and hurts the economy. Indeed, the province’s high personal income tax rates are so harmful the government should cut income taxes—not raise them—notwithstanding the deficit. The last government implicitly recognized that higher personal income tax rates (which it created) were not a good idea in the long run. In fact, the tax hikes were planned as a “temporary” five-year emergency measure. But like many “temporary” tax hikes from long ago, these ones are still with us. So raising taxes should be (and happily appears to be) off the table. That only leaves one option—reducing and reforming government spending. Spending is the source of Ontario’s fiscal mess. During the last government’s time in office, spending grew substantially faster than the economy that supplies the revenue. This is a recipe for disaster. Even with the Wynne tax hikes, revenue just couldn’t keep up with spending, causing debt to balloon. If the last government had restrained spending to the rate of economic growth, the massive run-up in debt wouldn’t have happened. 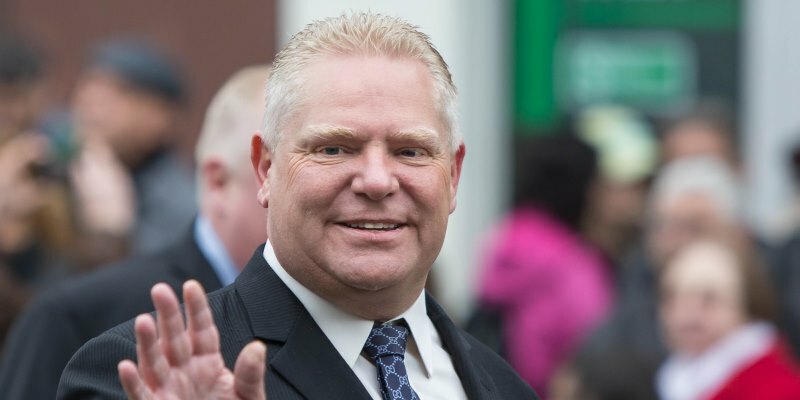 The Ford government must strike at the root and address spending. Let’s look at a few options. A good place to start would be a thorough review of what the province’s Financial Accountability Office calculates as $5 billion worth of corporate subsidies handed out each year. In the 1990s, the federal Liberal government slashed corporate subsidies (also known as corporate welfare) as part of its successful deficit-elimination effort. The new Ontario government should consider a similar strategy. A second place to look is the government wage bill. Spending on government wages and salaries comprises the majority of government spending in Ontario, and there’s almost certainly room for savings. One recent Fraser Institute study found government-sector employees are paid approximately 13 per cent more than comparable private-sector workers. Shrinking this pay premium could produce substantial savings. Of course, no one or two reforms can fix the problem; a thorough review of all government spending is long overdue. Unlike William F. Buckley, members of the Ford government campaigned with every hope of winning and governing. They’ve now been entrusted with that responsibility and we’ll soon learn if they’re willing to make the hard choices necessary to reduce spending to sustainable levels and repair Ontario’s broken finances.